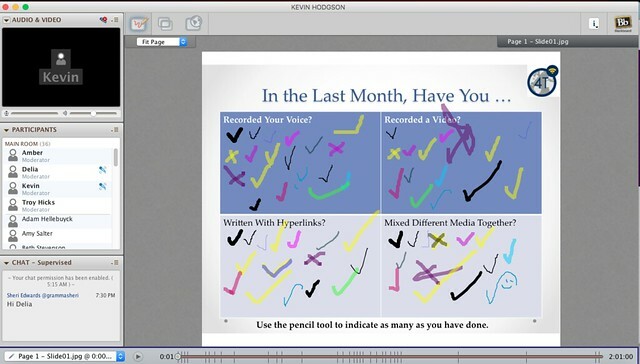 Keynoting and presenting in a virtual site like Blackboard Connect is sort of like hanging out with roomful of ghosts. They’re very friendly and curious ghosts, sort of like Casper if he were to become a teacher instead of just a cute spirit. You feel the presence of participants in the scrolling chat room as you talk to a screen featuring slides you made and know by heart (mostly). Sometimes, they take the mic. Yeah, being a presenter in that kind of screen-based format is slightly odd. But I was satisfied with how my keynote address for the 4T Virtual Conference on Digital Writing went last week. Even with my ghosts in the machine, I felt as if I accomplished most of my goals of exploring what we mean when we say “digital writing” (even if we/I haven’t solidified the thinking) and my own experiences with how digital canvasses might push the possibilities of how and what we write in different, and new, directions. I didn’t get to all that I wanted to get to, and I left some projects hanging in the wind. We never got to crowdsource a definition of Digital Writing. Thanks to the archiving at the 4T site, though, you can freely watch a recording or review the slideshow and resources of my keynote — A Day in the Life of a Digital Writer — at the 4T site. You can also access the notes and activities in the discussion that followed the keynote. I would also encourage you to tour through other workshops and other keynote addresses from the October celebration of digital writing, too. There are some pretty amazing resources and ideas out there. All of it .. free. I had five take-aways from my own session that I thought I would share here as a sort of my own post-keynote reflection. Presenting “what” you do requires deep reflection on “why” you do it. I found that as I was pulling together different projects that I hoped represented my “moves” as a digital writing, I was re-examining the rationale for why using a digital space might be different than a non-digital space. I’m not sure we always do this kind of reflective writing afterwards, but the value of it is immense. It informs our thinking now, and into the future. Reflection is the best non-digital aspect of digital writing, for me. I was asked a question from the participants about how I explain to parents and administrators the value and merit of all writing with digital. I had one of those “Aha” moments as I was answering. What I realized is that I never use the term “digital writing” with my students. Never. We just …. write. We call it writing. This goes to the heart of some of the discussion on what we call what we do when we write with technology and it bubbled up in the chat room and in the question/answer session of the keynote. As to the initial question, I explained that my role as teacher is to expand notions of what writing is and what writing can be. I value the writing my students do out of school and I want to hook as many of my young students as possible in as many platforms as possible, all with the goal of improving writing skills that we all value: clarity of message, sense of audience, writing to learn, etc. One of the projects I shared — Blink Blink Blink — brought back a lot of memories. As I looked at the date, I realized … that was 10 years ago. Ten years in the past, I was experimenting with multiple videos as a way to transform a poem at a National Writing Project Tech Matters retreat. I’ve been at this for some time, and still, I get the sense that I am nowhere near where I want to be as a digital writer. (Listen to my audio reflection after making Blink Blink Blink … and you can hear me struggling with some of the same ideas I am writing about here, ten years later). I have yet to finish any project and say, That’s exactly what my vision was. I always fall short. That sense of “are we there yet?” keeps me moving forward, experimenting and tinkering and trying out new possibilities. Still, to be honest, I wouldn’t mind a “we’re here” moment now and then. My push into digital writing is inspired by my students, all the time. I am constantly trying to figure out what they are doing, and why, and how what they might be interested in might inform how I can reach them as writers. Snapchat. Musical.ly. Video game design. Video production. I go where they lead me, and then I write and create, and come back to try to lead them forward, too. It’s a dance that we have, and it requires paying attention to the ever-shifting sands of technology and social media and young people. I won’t say I have a finger on the pulse — no adult should ever really claim that — but I keep my ears open. This is no new insight for me but as I look back on the projects that I shared in the keynote, you can’t help but see that collaborative elements are baked right into just about everything I do when it comes to digital writing. I can and do go it alone but I often would rather be writing and making with others when it comes to digital writing. I am empowered and nurtured by my fellow travelers — learning from those who are two steps ahead of me and encouraging those who are one step behind, as best as I can. We write, together. The entire DS106 ecosystem is chock full of amazing ideas and curriculum, and as an open network, it is all free for the borrowing and remixing. In particular, the Ds106 Daily Create is a fantastic source of daily ideas for making, writing, creating and more. Even if you don’t participate each day, the flow of ideas will get you thinking. I helped co-facilitate Digital Writing Month last November, but the founders of DigiWriMo decided, for many complicated reasons, not to do it this year. However, folks in the CLMOOC from the summer are planning Pop-Up Make Cycles mid-November as way to do some DigiWrimo-ish activities. 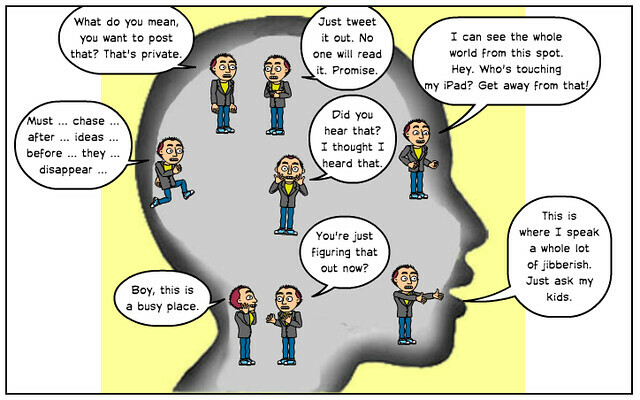 You can keep an eye on the CLMOOC website and the #CLMOOC or #DigiWriMo hashtags. Also, explore the Digital Writing Month website for incredible resources and analysis of what it means to write digitally. I curate a Flipboard magazine called Along the Edge of Digital Writing as a way to highlight some of the pieces that I come across that I think may push our thinking about the possibilities of writing. Remember how I ran out of time in my presentation with the crowdsourcing concept of brainstorming a definition of Digital Writing? Well, time is relative. Why not try it now? Come to the Padlet I had set up (which was the second step in the activity) and leave a few thoughts. What IS Digital Writing, anyway? You pack an awful lot into a 24 hour day and into a lifetime of teaching. I listened to the recording and I think someone said, maybe what were teaching is “communicating” not writing. I think that’s true, but it brings up another question to ponder. When we say “communicating” are we using this as an active verb, implying we’re sharing something with others? If that’s the case, is all writing, or communicating, intended for consumption by others? Or, is the act of putting ideas on paper, or in digital format, mostly intended to stretch our own creative muscles?